This afternoon we were able to scratch up some more beautiful wahoo on the troll they seemed to be biting the nomad lures best. Our evening bite on yellowfin tuna was nothing short of spectacular! It was a great way to end the day. 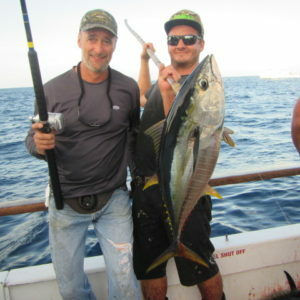 Captain Mike and Dylan B show off one of those quality yellowfin tuna that came aboard today. We will be leaving tonight and heading to our next destination.